The wars that have wracked the Democratic Republic of the Congo since 1996, killing well over 5 million people (International Rescue Committee, 1/08) in what may be the deadliest conflict since World War II, are officially over. A peace agreement was signed in 2002, and general elections were held in 2006. But conflict and the humanitarian crisis continue. The most recent survey (IRC, 1/08) estimated that 45,000 people are dying each month from conflict-related causes (primarily hunger and disease), nearly the same shocking rate as during the war itself. And with the recent flare-up of violence in Congo’s volatile east, things don’t seem to be getting any better. 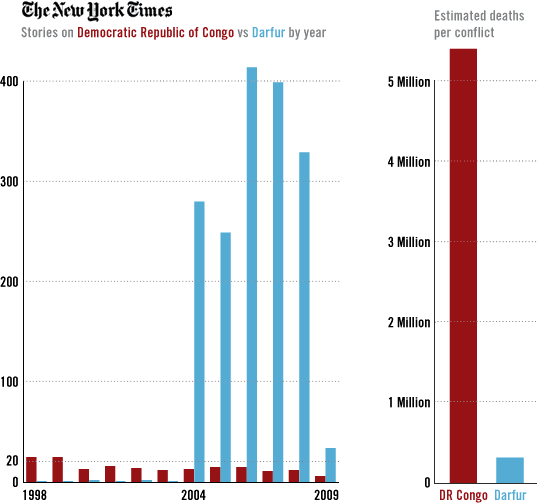 To put the death rate in perspective, at the peak of the Darfur crisis, the conflict-related death rate there was less than a third of the Congo’s, and by 2005 it had dropped to less than 4,000 per month (CRED, 5/26/05). The United Nations has estimated some 300,000 may have died in total as a result of the years of conflict in Darfur (CRED, 4/24/08, SSRC.org, 3/25/09); the same number die from the Congo conflict every six and a half months.